What endears passengers to their bus? In many respects, nothing! Passenger's "relationship" with their bus service can often run deeper though. Let's be honest, unless you're a fan of buses, your excitement levels will barely reach above "mundane" on the Richter scale when one appears. But you don't have to be a bus enthusiast to appreciate your local bus service a little bit more. Around my local parts, National Express West Midlands has been running a "Love Your Bus" campaign. I see the thinking and logic behind it, but such a campaign is meaningless unless passengers are genuinely delighted with their travel experience. I'm usually satisfied with NX services, but "wow" factors are rare, unlike when I use some of the UK Bus Awards winning companies. It's a bit like First's TV advertising campaign last year. Like them, I agree that "buses are our future", and I actually think that the industry should shout more about the vital and good work that it does every day. But First's TV ad was too cheesy! A bit of fun, maybe, but the result was, at best, some disbelief from regular passengers, and at worst a slating from some quarters. But First is up to something more subtle, and the results could deliver far more than a jolly TV ad. "Better Journeys For Life" is MD Giles Fearnley's attempt at turning around First's UK bus division. The new "manifesto" contains new commitments to customers, staff, partners, shareholders, safety, the environment and "developing the art of listening". I've used First services throughout the UK, and whilst I don't necessarily buy into the "company bashing" that some people engage in, I've often been left with a niggling cold "corporate" feel to their services, which begins with the "barbie" pink livery. Now, the colour of the bus shouldn't matter one iota, yet I believe company livery is vital to kicking off a passenger's experience with a bus company. Some of the UK's best operators have understood this. TrentBarton in Nottingham and Derby have employed the services of designer Ray Stenning to stunning effect. Ditto Go North East. The result is a plethora of individually liveried routes. What's so special about that? I think it encourages a subtle feeling of "ownership" inside regular passengers. "That's MY bus" - because, it has a hyper-local feel to it. Add other elements of community feel, such as regular drivers who get to know their passengers and you have, potentially, a winning formula. And for visitors and non-regular users, the bright individuality of a route is reassuring. When I was carrying out some mystery shopping for Go North East a few years ago, I found myself in places I'd never been before - the sight of, say, a bright orange bus on the "Fab 56" service (as it has been branded) gives a lot of confidence to the intending traveller. Buses ARE local. They serve their local communities and are at the heart of them. I've never really felt that imposing national branding has been the right way forward. Even the National Bus Company of the 70s acknowledged that, despite the monolith livery imposed from the top of the tree, the local operating name survived. First's move to "localise" operations is as welcome as is necessary. 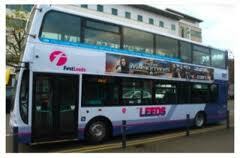 As part of its "Better Journeys For Life" manifesto, a gradual image change to something more local will follow, starting in Leeds. And yet, the "new" livery isn't that different to what is already there. I suspect a wholesale change might have proved to much, too fast. And of course, it would have taken literally years to repaint the entire 8000+ First fleet (as is proving with the achingly slow transition from Travel West Midlands to National Express West Midlands around my local area). But it's a start, and I wish Giles Fearnley all the very best in his quest to make First a more human, friendly face. He's certainly the man to achieve this. It'll be fascinating to see how this progresses.